You are here: Home / What Would Happen if you Flipped the Scotland #indyref Question? What Would Happen if you Flipped the Scotland #indyref Question? As a result, the “Independent Scotland” campaigners are called the “Yes” camp, and those who want the UK to stay together are the “No” camp. In other words: in a poll of 1,000 people in Scotland, when asked the reverse of the independence question, there was most definitely not a strong swing toward keeping the union. You could ask further questions: “Has months of seeing ‘yes’ vs ‘no’ genuinely moved peoples’ opinions toward ‘yes’?”, would the ‘Yes’ campaign have been successful if they had been campaigning with ‘No’ banners for months, etc, but I think there’s enough here to satisfy the smaller question, and to say that the framing of the question does not appear to directly affect the likelihood of someone flipping their vote. As per previous surveys I’ve carried out, this was carried out via the web. 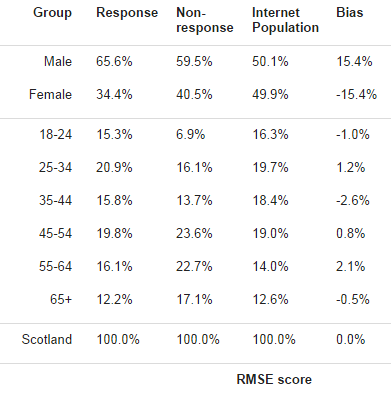 The results are weighted to match the ‘Internet Population’ of Scotland, which is generally thought to trend slightly younger & slightly more urban than the general population.